Filters are a great way to organize your Deals. Whether you want to dig a bit deeper into your data or find ones that are outstanding, filters can answer your questions and help you find what you're looking for. Template - what Template was the deal created from? Recipient - who are your counterparties? Status - what status is the Deal in? 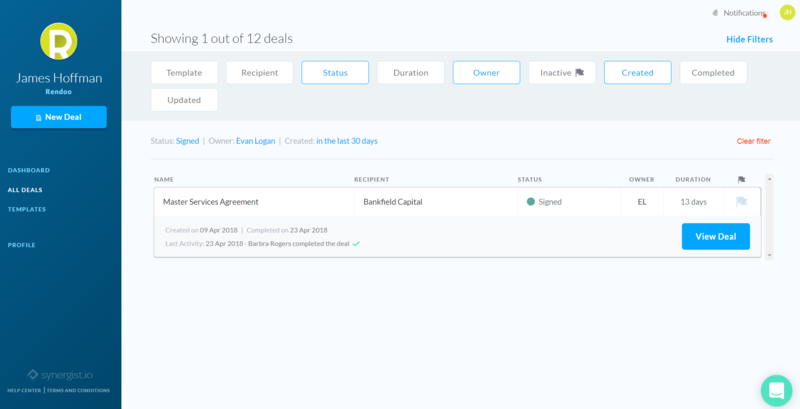 Duration - how long is the Deal taking? Owner - who owns the Deal? Inactive - is the Deal inactive? Created - when was the Deal created? Completed - when was the Deal completed? Updated - when was the Deal last updated? Now you can click the Deal to get an expanded view with more info and open the deal itself. What is the inactive flag? If a deal has not been updated in the last 7 days synergist will mark this as "inactive" for your consideration.